At 3,800 meters above the sea level, Lake Titicaca is the highest navigable body of water in the world. It’s also the largest lake in South America with a surface area of 8,372km2. Its location is somewhat peculiar – it lies astride the border of Peru (to the west) and Bolivia (to the east). For this reason, Lake Titicaca can be easily accessed from two countries. The most popular entry point from the Peruvian side is Puno, while the city of Copacabana is a convenient choice when travelling in Bolivia. They can both be reached by bus, car and plane. Plus, there’s a scenic train connection to Puno that runs through some of the most beautiful Peruvian landscape. Arriving at Lake Titicaca by bus is the most affordable option but you’ll need to brace yourself for a long drive and possible delays. Direct buses to Puno run from Lima, Arequipa and Cusco; you can catch a direct connection to Copacabana from La Paz. If you want to explore the lake from both countries, there are also buses between Puno and Copacabana that take around 4 hours (plus an hour or so at the border). Getting to Lake Titicaca by plane is much faster but also way more expensive than the bus (always the way, isn’t it?). Note that Copacabana has its own airport, but to reach Puno you will have to fly to the nearby town of Juliaca and then take a taxi or bus. And, of course, if you’re feeling brave you can also get to Lake Titicaca by car. Beware of the high altitude, though! Driving at over 4000 meters above the sea level can be dangerous if you’re not used to it. In any case, there is no one definite answer on how to best get to Lake Titicaca: it all depends on your budget, schedule and travel style! What to see at Lake Titicaca? It is no surprise that a lake of this size boasts incredible biodiversity. Lake Titicaca is home to over 500 aquatic species, including the spectacular Puna ibis, charming Chilean pink flamingo and a little bit less charming Lake Titicaca frog (it can weigh up to 3kg!). Part of the lake is actually a protected area under the name of Titicaca National Reserve. Thanks to the great efforts at sustainable tourism, you can enjoy splendid bird-watching and trekking opportunities here. Fans of archaeology and history won’t be disappointed. If you want to get a taste of pre-Colombian South America, you can visit the ancient sites around the lake. There are impressive burial towers built by Colla people at Sillustani and Cutimbo. In Ichu, you’ll find a temple complex set on a hilltop with stunning views. And if you’re dreaming of visiting the Khajuharo temple in India famed for the pornographic art, you can get a little preview at the Templo de la Fertilidad (actually not so little, you’ll see what I mean). Lake Titicaca is a place filled with history, legends and uncovered mysteries. According to Incan mythology, it’s the birthplace of the first Inca king, Manco Capac. Another myth says that the creator god emerged from Lake Titicaca before creating the Sun, Moon and stars. Hence, the romantic nickname ‘the birthplace of the Sun’. The mysterious lake has also received its own version of the Atlantis legend – rumor has it, that there is a lost city under the face of the water. Well… this one proved to be more than just an old wives’ tale when the researchers found underwater ruins of an ancient temple at the bottom of the lake. So who knows how many other secrets are still waiting to be uncovered? The towns on the shores of Lake Titicaca are more than just stopping points. Tourists tend to overlook Puno and head straight for the islands, but there’s actually plenty to see there. If pastel colonial architecture is your thing, don’t miss out on a stroll around this charming city. On the Bolivian side, Copacabana boasts an amazing Portuguese Basilica and a laid-back waterfront with views over the lake. Well worth a stop! With all that said, it’s the islands that are the star attraction at Lake Titicaca. 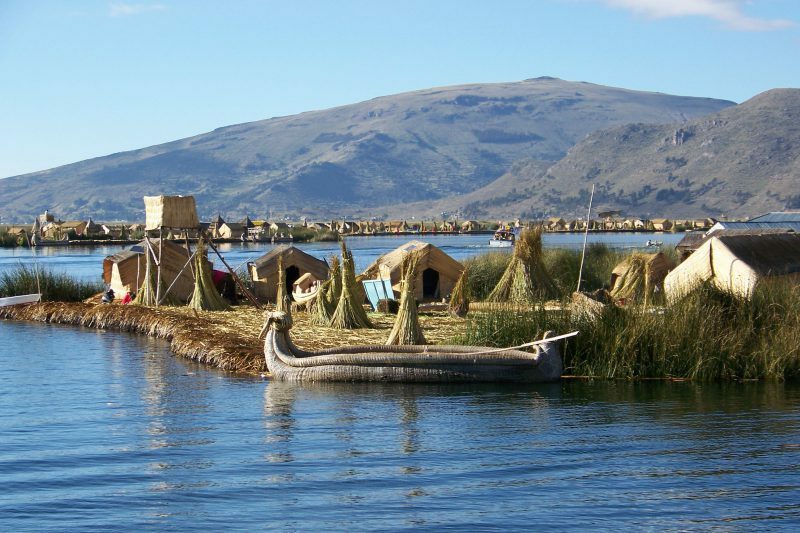 The floating islands (Islas Uros) are the most scenic of all with their signature reeds homes, boats and crafts. Coming from the Bolivian side, your itinerary will be incomplete without visiting the spring of youth on Isla del Sol. For those interested in local crafts, Isla Taquile is a real treat. Here you can watch the indigenous people busy at work weaving and knitting traditional colorful garments. If there’s one thing that you need to make a priority when visiting Lake Titicaca, it’s the incredibly diverse islands with their own unique communities and customs. If you like breaking bread with the locals, you’re in luck. At Lake Titicaca, there are plenty of opportunities to meet the islanders, the Uros indigenous people who have been living here for hundreds of years and experience their everyday life. With agrarian culture dating to pre-Columbian time, you might be forgiven for thinking that the time has simply stopped on Lake Titicaca’s islands. To enjoy your visit to the lake to the fullest, choose an island homestay. At Isla Amantani, it involves helping with everyday tasks like cooking and taking part in community activities such as traditional dances. On Isla Taquile, you can watch the local crafts and perhaps even have a go at weaving yourself. Each island has its own unique character and offers different activities. This is a really common question and the answer is a more complicated than yes or not. See, the salinity of the waters of Lake Titicaca is about 5.5 parts per 1,000. Is this a high number? Not compared to seas. The Mediterranean Sea has 38 parts per 1,000, the Red Sea has 36, while our oceans are ranging between 34 and 36. The least salty sea on Earth is the Baltic see at just 10 parts per 1,000. The salinity however is much higher than of other lakes that have 0 to 0.5 parts per 1,000. It’s safe to say then that Lake Titicaca will not taste like a sea, but it is slightly salty. The historical explanation of why it’s salty it’s because it used to be a salt water. It sits in a sedimentary basin that used to be below sea level, which then was uplifted as the Andes were created. The glacier water and the inflow of 27 rivers made it less and less salty by time. May to September (winter season) is the driest time of the year which makes it most convenient for visiting Lake Titicaca. December to March (summer season) is warmer but there is also a lot more rainfall which can spoil your hiking and sightseeing plans. To experience the famous Festival de la Virgen de la Candelaria (celebrated both in Puno and Copacabana), you need to schedule your trip in the first two weeks of February. Looking for a combination of good weather and cheaper prices? Aim for the shoulder season – April and October don’t see as much rain as the summer, and they tend to be less busy with tourists than the high season. Lake Titicaca is located in the Alpine climate with cold temperatures most of the year. In winter, subzero temperatures are not uncommon (especially at nights) and even in summer, you’d be lucky to see above 15 degrees on the thermometer. So don’t be fooled by ‘summer season’ and bring warm clothes regardless of the month you visit. 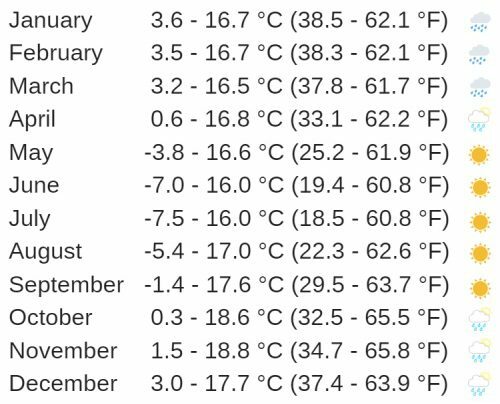 Surface temperatures average 14°C (56°F), temperatures are slightly lower at 11°C (52°F) at the bottom. You’ll need to have some Wim Hof lessons not to be cold in the lake! Alternatively take a wetsuit or just try not to fall into the water. Remember that the lake is set at a dizzying altitude (quite literally). If you don’t want to fall victim to altitude sickness, take things slow and allow yourself time to acclimatize. Prevention methods include drinking a lot of water, steering clear of alcohol and cigarettes, and avoiding excessive exercise. You can also try a local altitude sickness remedy – coca tea. Not only will it elevate the headaches but also give you a kick of energy comparable to a cup of coffee. Don’t forget to stay on guard for pickpockets. Keep your valuables in a money belt and stay particularly vigilant in crowded places such as bus terminals or train stations. Also, remember that hostels are not always safe so lock your possessions before leaving them in the room.